Last week we were able to get our Coram Colonial under contract at just above our asking price. We listed the home for $339,990 and received an offer of $340,000. Yes it is only $10 above our asking price, but that said I had originally pegged this home to have a $330,000 ARV so I’m certainly happy to see a $10,000 increase above our projections. Originally when I posted back in December, my expectations were to put about $60,000 into the rehab. We surpassed that by a small margin to the tune of $64,000, but that was primarily due to upgrading the electrical services as well as adding some bonus features for our buyers. I haven’t had the chance to update you on the status of the rehab since I first posted that we had closed on the property, so this article will take you through everything that has happened since. So we started this particular project right before Christmas with the expectation of being done some time in the middle of February. For the most part we were able to stick right on schedule. Outside: New Roof, New Siding, New Windows, New Gutters and New Shutters. We also did some minor landscaping and power washing. Inside: Gutted and replaced Kitchen and 2 Bathrooms, Spackled and Painted the entire home, New Trim and New Doors (including crown molding), Removed a wall to open up the kitchen more, Replaced the electrical panel and Refinished the hardwood floors as well as added some laminate flooring in the den area. Interestingly enough there was a house across the street that was purchased on Auction.com right around the same time that I purchased this home. Even more coincidental was the fact that the house was purchased for the same amount so we literally had dueling flip projects competing with each other at the exact same time for the exact same purchase price. There were some differences however. While I am biased, there were several things about our house that set us apart from our competition. First our house was a colonial as opposed to a split ranch and had a far more conducive layout for a larger family. Second, our house backed up to a nature preserve whereas the other house simply backed up to an adjacent backyard. Lastly the quality of our rehab in my opinion was much better. Our house had quartz counter tops, hardwood floors and we literally replaced just about everything in the house with the exception of the boiler. This isn’t me trying to criticize what they did, but the condition of our house left us without any choice but to rehab everything. A lot of the features to the competing home, they were able to salvage and I don’t necessarily blame them for keeping some of those items. At the end of it all though, new is new so I thought those elements really made our house stand out. The competing flip wound up finishing their rehab a week before us. Originally we were going to list our home for $329,990, but as the market continued to strengthen, my broker and I discussed listing it for $339,990. Once we saw that the house across the street was listing their home for $339,990 we knew we had to do the same. I had always felt our house could fetch at least $330,000 so this solidified that thought. The week of their first open house, buyers could see that we were putting the finishing touches on our home as my contractor was outside doing a few things. For a few hours he morphed into a real estate agent showing the house to prospective buyers who came to view the home across the street. Shortly thereafter my broker (the real one) was inundated with phone calls, but we agreed to put off all showings until the first open house. To say that a week later our open house was crowded would have been an understatement. According to our checklist we had at list 40 groups of people come in to see it. Buyers loved our finishes and shortly thereafter we received an offer for full asking. This however is where it became a little frustrating. I’m someone who sticks to his word so if I say we have a deal then that’s the end of the story. Well unfortunately that comes back to bite me every so often. So when we agreed to sell the home to this particular buyer at full asking, we informed anyone else who inquired that we already had a deal in place. In New York, specifically in Long Island, an inspection of the home is done prior to going to contract. It took several days for them to schedule the inspection and we were under the impression that they had conducted their inspection on the scheduled day. It took several days thereafter for us to get in touch with their agent only to discover that not only had they not done their inspection, but they found another house and were backing out of their deal with us. That was quite frustrating to say the least as we cancelled our open house for the following weekend as a courtesy to them, and turned away other potential buyers in the process. Once we reopened for offers we received several more, but most of them had contingencies to sell their current home or were looking for very large seller concessions that would have required the home to appraise for more than we thought it would have been worth. I was quite frustrated to say the least because I knew the home was priced correctly, and I fully expected to receive an offer at or above our listed amount. Sure enough within no time of all this occurring an offer was placed on the home which after some negotiating we were able to get up to $340,000. The buyers knew we had other offers, and they gave us the amount we were looking for to secure the deal. The inspection went forward without any issues, and a contract was signed a little over a week later. I was very happy to sell this home to these particular buyers. They had lost out on a previous home after having a verbal agreement in place. Like I said, that’s not how I operate so when I attended the inspection, I informed the husband that if he wanted to proceed forward, the house was all his. The best deals are those where everyone is happy. I was happy with what we received for the home, and to be honest I think in this market, $340,000 for a completely rehabbed colonial in a nice neighborhood that backs up to a nature preserve is a very good value for someone. One of the things that can really affect your bottom line is holding time, and the nice thing is that these buyers have already been given a commitment (not a pre-approval) so the mortgage timeline should be much quicker and subsequently we should have the house sold by late April to early May. 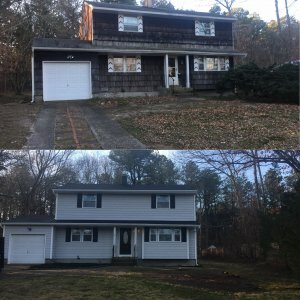 This would potentially be a 4.5 month holding time which is excellent for any fix and flip. I like to budget 6 months, but sometimes you get lucky. By doing the right thing and sticking to my word with the first buyers, did I hurt myself a bit with this flip? I suppose that’s possible, but that’s not going to change how I conduct business. You can’t base what you do off of what you expect someone to do in return. You have to be true to your own values and trust the process. In doing so we still received what we wanted for the home, and fortunately the home will go to a great young family that will enjoy the house for years to come.